Workplace accidents are no laughing matter. Countless occur every year, resulting in injury to workers and damage to client and company property. However, many of these accidents are ultimately preventable when employees take the necessary precautions and plan ahead for potential problems. Keep these common construction site safety tips in mind and remember that prevention is as simple as checking the area. 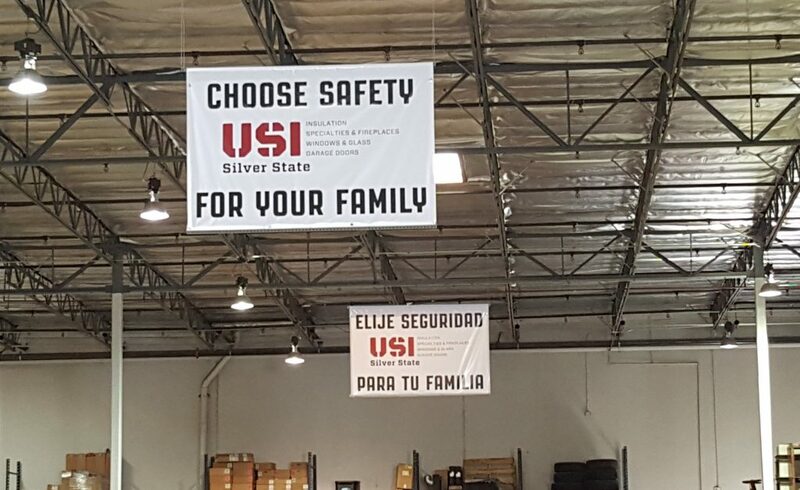 USI Safety Banners hang in every one of our warehouses across the country. Employers should provide their workers with proper protective gear and clothing. If you as a worker do not have them, demand them from your employer and wear them correctly. At USI, we adhere to our standard “safety first” program, which gives every employee the authority to stop any job if there are safety concerns. Construction sites require a lot of electrical installations. Lifting equipment mostly involves electricity and weights. If you are using plugged-in portable devices, such as grinders or drills, you should always check that the cables are protected, the metal casing is grounded, and the power supply is provided with an earth leakage circuit breaker. You should have trained personnel on-site who know how to handle hazardous materials. A training program should include how to store, transport, and dispose of hazardous materials you may come in contact with during the course of operation. The personnel should also know what type of protective gear to wear. If you don’t have trained hazmat personnel handling materials, you need to resolve that! Different types of hazardous materials should be kept separate from each other. Failure to properly separate materials could result in serious reactions, like fires and explosions. It is unlawful to take hazardous waste to a landfill or dispose of it in a regular trashcan. You will need to contact a hazardous waste hauler to properly and lawfully remove hazardous waste from your property. Notice the number of fatal injuries and falls that happen in areas where there is no fencing. Dangerous areas that you see without fencing or with broken and damaged fencing should be avoided until they are completely repaired or a proper fencing is in place. Builders often rely on requisite industry or home inspections for peace of mind, but in some cases formal inspection requirements are minimal. Boilers and other appliances can malfunction immediately following an inspection. Cautious property managers need to ensure that their installations remain functioning well above the minimum state requirements, which will mitigate risk and enhance performance.